- Hughes/ Thrall was musical project formed in 1982 by former Deep Purple and Trapeze bassist/vocalist Glenn Hughes and guitarist journeyman Pat Thrall. While Pat Thrall had spent the late 1970s and early 1980s making a name for himself by playing with the likes of Automatic Man and Pat Travers, former Deep Purple member Glenn Hughes recorded one solo album after the demise of Purple in 1976 entitled Play Me Out; a record that focused more on his love of soul and funk rather than hard rock. Play Me Out had limited success and Hughes had slipped off the musical map, save for a few guest appearances here and there. Hughes moved to Los Angeles to write with the intention of releasing new material. 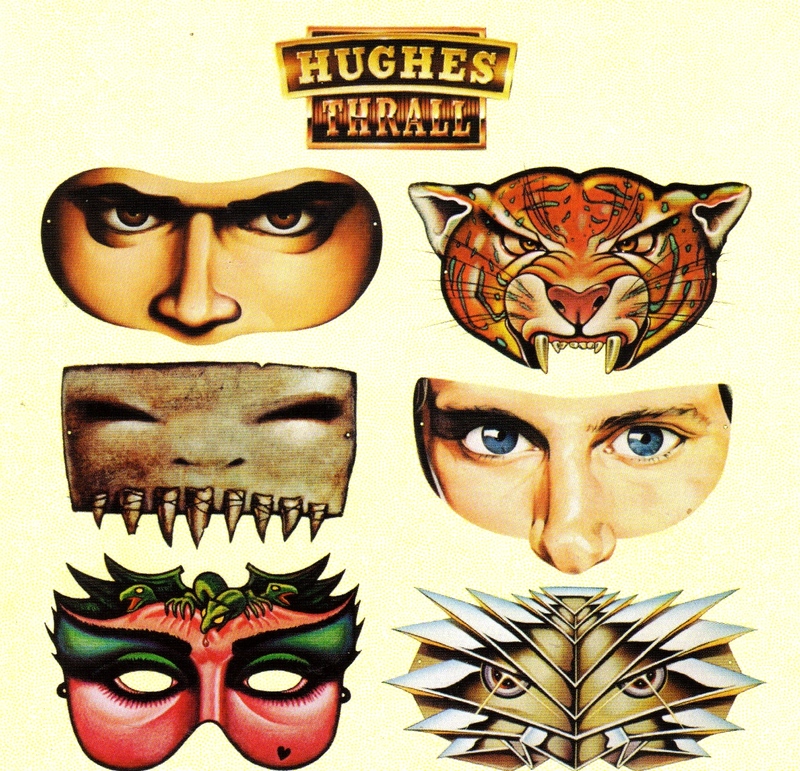 In 1981, Thrall's playing caught Hughes' eye and the two formed a musical partnership. After a period of jamming and writing they started recording with producer Andy Johns (who had previously worked with the likes of Led Zeppelin, Free and The Rolling Stones). They released their debut album, simply called Hughes/Thrall in August 1982. Released on a short-lived subsidiary of Epic, called Boulevard Records, the album had little marketing behind it and although it received critical acclaim it failed to make a big impression with the music buying public and saw disappointing sales. Hughes blamed some of the obscurity on the fact that both he and Thrall were suffering from drug addictions at the time, and couldn't support the album with a proper tour. The album itself had a definite radio-friendly, album-oriented rock sound. However it also had elements of post-punk and new wave, many musicians and critics have cited the record as highly influential to the direction of rock music in the eighties. Over time it has become something of a cult record. Hughes/Thrall took to the road for a short American tour, playing a handful of gigs in California and Texas supporting Santana. The touring band featured drummer Tommy Aldridge and keyboardist Jesse Harms. The pair recorded some demos for a proposed follow-up to the first album, but these never ended up being released and the album was scrapped. A few of these demos have surfaced over the years, but are of limited quality. One of the songs originally intended for the aborted follow-up to Hughes/Thrall, "Still the Night" later appeared on the 1985 Phenomena album, which featured Hughes’ vocals. This song also made an appearance on John Norum’s 1992 album Face the Truth, again featuring Hughes. Thrall would also record another version of the song, re-titled "Steal the Night", alongside former Strangeways frontman Tony Liddle and Billy Rush of Southside Johnny & The Asbury Jukes, though this never progressed beyond demo form. Hughes and Thrall did team up again in 1987 to record a track for the Tom Hanks-Dan Aykroyd comedy Dragnet. The song, "City of Crime", featured Hanks and Aykroyd rapping the verses, while Hughes sang the chorus. It was released as a single and a promotional video was shot, which received heavy rotation on MTV. Two songs, "You Were Always There" and "Devil in You", from the abandoned follow-up album were included on Hughes’ 1994 solo album From Now On...; although both were new recordings that did not feature Thrall’s playing. Thrall did, however perform on Hughes’ 1995 album Feel, playing guitar and keyboards on eight of the tracks and co-writing two of them. To date this is the most recent collaboration between Hughes and Thrall. In 2006 it was announced that Hughes and Thrall were actively working on a follow-up to their 1982 album, and were in the process of writing and recording new material. In September, they started the final phase of the recording process, and announced that the album would be released in 2007. The news of the new album coincided with the setting up of hughesthrall.com. The first Hughes/Thrall album was remastered and re-released in January 2007 on Rock Candy Records. This new version included two additional tracks. In 2007, it was announced on their website that Hughes/Thrall 2 had been pushed back to 2008. They also stated that the album includes thirteen songs, of which eleven are new compositions, while two date back from the sessions of the scrapped initial follow-up. In June 2009, Hughes confirmed "I have put the Hughes/Thrall 2 project behind me... We started the album in 1997 and Pat Thrall wanted to produce it by himself. Ten years to produce an album? I usually take no more than six months. Let's move on with our lives." - An unusual pairing, and coming from different backgrounds leading up to this point, but the teaming up of singer/bassist Glenn Hughes and ace axeman Pat Thrall certainly presents some interesting options musically. Sick of being treated like an outcast by fellow guitar strangler Pat Travers in his band, Thrall set off for greener pastures. A very technically accomplished guitarist, even as far back as his days playing with Automatic Man, he was been given some latitude on this album, combining with a singer who could sing the socks off Santa Claus coming down the chimney! Hughes of course had spent time with Deep Purple and Trapeze, and his hard hitting style was a great foil for Thrall's aerodynamics. What a great introduction we get with the awe inspiring 'I Got Your Number', big crunching guitar riffs and Hughes' trademark vocal howl. The solo is also one for the G.I.T grads to check out. 'The Look In Your Eye' has been one of my personal favourites for many years, containing subtle keyboards and a killer chorus. 'Beg Borrow Or Steal' has a pompy feel to it while 'Muscle And Blood' is pure hard rock, with some of the steamiest rhythm guitar work this side of a strip joint! Also on the hot rockin' menu are the clean grooves of 'Hold Out Your Life' and the melodic gallop of 'Who Will You Run To'. I just love those guitar tones of Thrall, and the way he uses analog delay effects. Or how about the heavy Led Zeppelin like smash of 'First Step Of Love'? I think Frankie Banali plays drums on this one. He's the only one of the drummers named above that could smash that hard. "There have been some strange rumours concerning the welfare of Glenn Hughes since his departure from Deep Purple five years ago. Tales about him being 'strung-out' on drugs in Los Angeles, where he now lives, have been rife. The chances of the music world hearing from the former Deep Purple bassist / vocalist were becoming increasingly remote. Indeed, while the likes of Blackmore, Gillen and Coverdale have enjoyed a good deal of success, all has remained quiet on the Hughes front. Until now, that is. At last, the man is back, ready to attack with a mighty powerful new outfit. Together with former Pat Travers Band guitarist Pat Thrall and 'unknown' drummer Frankie Banali, Glenn has assembled Hughes-Thrall, who are currently in the studios working on material for their debut album. At this stage, recording deals are being negotiated and already the group's publishing has been snapped up by Warner Brothers Music. Glenn and I recently rendezvoused in the plush Beverly Hills offices of his new management company, where his protracted vow of silence was finally broken. "It's weird," he mused, "because I haven't done any interviews for over five years. I'm ready for this!" And so, with the tape machine rolling, our conversation began. Naturally, the first topic of discussion was the evolvement of the Hughes-Thrall band. Glenn explained' "I'd been lying low for quite a while and then about three years ago I was supposed to put a band together with Ray Gomez and Narada Michael Walden for Atlantic Records. We went to New York to sign but the project was shelved when Gomez decided to sign with Columbia. And then a year ago I was asked to form another group with Gomez and we got a drummer together but things didn't work out. Eventually I was asked who I really wanted to play with and I said Pat Thrall, because I knew he'd finished with Travers. So he came down last April, we auditioned some drummers and we've been rehearsing ever since." "Pat and I are good for each other. We both like the same sort of music and both have this incredible feeling for what we play. Forming this group was no last ditch effort as far as I was concerned either. I'd rather have never worked again than work for the sake of it. I can't go on stage or make a record of stuff that I don't want to play. After Deep Purple I decided that the next thing I'd do would be what I really wanted to. I wasn't prepared to join another band where I didn't have that much of a say." To these ears, Glenn Hughes has one of the finest voices in the business, and combined with the acclaimed guitar playing of Pat Thrall the end product should be extremely interesting. While over ini LA, Glenn played me some of the songs they recorded. The music has strong leanings towards funk but at the same time retains the overall 'heavy' feel. In fact one track in particular, titled 'Pay The Price', is mind-blowing. Check out the masterful vocal and axework when this one surfaces on vinyl. When I asked Glenn to describe the band's music, his answer was short and to the point "We play eighties funk/rock 'n' roll." Hughes is adamant that he's never had a better working relationship than the one he with PT. "I couldn't have picked a better person to play with than Pat," he enthuses. "He's always been in the background. He was a sideman with Travers and got treated real badly. I've brought him out of that and when we're in the studio I push him all the time, because I know how good he is." Hughes-Thrall are recording their album at studio in Malibu with the aid of producer Rob Fraboni, whose previous credits include Eric Clapton, Joe Cocker and Bonnie Raitt. Aside from his work with Purple and Trapeze, Glenn's only other vinyl output was his 'Play Me Out solo LP. However, that too takes us back to the seventies and I wondered how he feels his voice is holding out these days. "I don't want to sound big-headed but I think I'm singing better. You see I don't smoke and I don't touch liquor any more, and I hardly ever get a sore throat, I'm so lucky — I think God must have said 'Let this boy sing'." It looks as though Glenn Hughes should be back on the road before the end of 1982 and he'll probably kick off in Japan, where he always had a strong following. America will a prime target for Hughes-Thrall but there's every chance that the band could come to Britain immediately after their Far Eastern tour. For the time being, they continue to work in the Californian sunshine. So there you have it . . . Glenn Hughes is alive and kicking in LA. In fact, as we wandered down the elegant driveway towards his car, the sun blazing down, I could see why he's quite happy to reside in the States. And somehow, I think the kids are going to like Hughes-Thrall." Top of the import charts for weeks, we had a load of reviews in before the UK version was issued, and I would even hazard a guess that it was the quantity of imports which made them rush it out here too. "Single sleeve cover, with lyrics on just one side of the record bag. The music? Well being a Hughes fan on first hearing I was disappointed as I'd expected it to be like Play Me Out. This is more rock which might get the anti-Hughes brigade to give it a listen. It opens with I Got Your Number; a powerful rocker, Glenn's voice sounding good and he sticks to what you describe as his 'normal vocal range', even letting out one or two Gillan type screams! The Look In Your Eye is easily the most commercial song on the album, a single in America I believe, and I'm quite positive that released here with airplay it could be a big hit. You could descibe it as an up tempo type Hall and Oates number. Beg, Borrow or Steal is more soul, with a synth dominated sound and little guitar. Next is a slow number, Where Did The Time Go again with little guitar but Thrall makes up for this on the closer Muscle And Blood. It also shows that Glenn can still play heavy rock, it's as powerful as anything Rainbow or Whitesnake can churn out. Just two of the many positive reviews. I've only heard snippets myself, and the immediate reactions were that it reminded me of Rainbow - in the production style, which is generally very professional, and The Police! Towards the end of last year, the debut album from Hughes-Thrall was released in America and subsequently topped the Kerrang import album chart for several weeks. Mind you, this was hardly surprising when one considered the overall strength of the material and the abundance of musical talent contained therein. Former Deep Purple bassist Glenn Hughes has an amazing voice and his partner in crime, ex-Pat Travers Band guitarist, Pat Thrall has an excellent reputation in the axe world. The two musicians initially started working together several months after Pat had quit the Travers set-up, although they'd first met in New York a few years earlier. According to Glenn: "I'd always considered Pat Thrall to be an amazing guitarist and when I found out that he wasn't doing anything I asked him to come down to Los Angeles, where I've been living for a number of years, to see if we could put something together. Things started to happen very quickly and before long we began recording demos of some of the songs we'd written together." After a brief spell in the demo studios, Hughes-Thrall decided to master their product and aim for an immediate deal. There was plenty of record company interest but it took a while before any contract was signed. In the end, it was Boulevard Records (a CBS affiliate) who picked up on the outfit. "Quite a few companies were keen to sign us," states Thrall, "but we were quite happy to go with a smaller label like Boulevard, rather than one of the majors, where you can get kinda buried in the system. We felt that we needed that intimacy between the band and a label. Going through the red tape and the bureaucracy of a large record company, you can totally lose out in this day and age." While their management were negotiating a deal, Pat and Glenn kept themselves busy in the studio, using producer Rob Fraboni. However, dissatisfied with the way things were going, they opted to work with Andy Johns, whose past credits include Free, Zeppelin and the Stones. "It just wasn't really happening with Rob Fraboni," Glenn explains. "We felt that we were outgrowing the nature of his intentions of what he wanted as opposed to what we wanted. We really weren't happy with the sounds that were coming out of the studio. We wanted the more British rock edge and that's why we got hold of Andy. Free were always one of my favourite bands and so Andy's work with them was a good enough qualification on its own – and he was f**king great. He was very easy to work with in the studio and I think he added a lot of intensity to some of the tracks on our album." 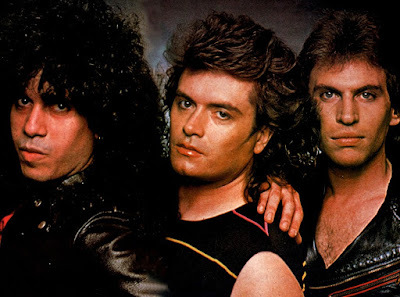 As well as varying the producers, Hughes-Thrall also employed three different drummers: initially they used Frankie Banali (now (re)working with ex-Ozzy bassist Rudy Sarzo in Quiet Riot) before enlisting the services of Gary Ferguson and Gary Mallaber. The latter played on and wrote the majority of the tunes on Steve Miller's 'Abracadabra' album. The Hughes-Thrall LP was completed in July '82 and surfaced in Stateside record stores a month or so later. Curiously enough though, it's only just come out in Britain and one suspects UK sales will be affected by the large influx of import copies. Ideally, it should have been released simultaneously on both sides of the Atlantic. Nevertheless, it's still a must and finally allows both Glenn and Pat to step into the limelight. In the past they've tended to be retained in the shadows to a degree – Hughes with Purple, and Thrall with Travers. The new combo allows both of them to establish their own identity. Glenn: "The way we look at it, this album is like two solo LP's in one. After leaving the Purple set-up I actually did a solo record ('Play Me Out' on Safari) but I didn't want to do another because I thought it was too gruelling and basically too much of an ordeal. I wanted another very creative person to bounce ideas off and Pat was ideal. Solo albums are scarey!" Pat: "I'm inclined to agree with Glenn. I never really had much interest in a solo album, this is what I wanted to do. And I've used this record for getting certain things out of my system –to concentrate on songwriting and not just pursue straightforward rock 'n' roll. And I now feel that I'm letting people know I can do more than just play the occasional lead break. "I think that there's a fair amount of diversity in the material and it gave us the chance to show-off more of our abilities other than the ones we're known for. Like I used synthesisers quite a bit and probably held back a little on my lead guitar because I wanted the record to be more song-orientated." Glenn and Pat appear to work extremely well together but one wonders whether tempers ever got heated during their recording sessions. Almost collapsing with laughter, Pat answers: "Oh yeah, we almost killed each other a couple of times!" "Making records is not easy," assesses Glenn, "especially when you have to let go a producer midway through an album." Pat: "I think the main cause of any arguments we ever encountered was down to the fact that I'm very slow and tedious in the studio. It takes me a long time to get what I want, whereas Glenn goes in and does everything in one or two takes. After that he gets bored and leaves." Do Hughes-Thrall consider that their absence from the hard rock scene will benefit or hinder them? "I think it's gonna work in our favour," declares the Californian guitarist. "I've been away for two years and Glenn's not done anything for five, but you can't really tell from the record that we've been off the scene. And the fact that we've not been in the public eye recently probably put a lot of intensity into the record. You can hear the urgency and tell that we're hungry." Glenn: "This is the first major thing I've done since Purple and I feel very lucky and proud to have it out. It shows what we can do together as a team and, without wishing to sound big-headed or anything, I think it's a bloody good debut LP. I'm the last one of the Deep Purpleites to do anything and I believe that in terms of overall acceptance this is a stronger international record than any of the others have come up with. I don't want to start any slagging matches – God bless Whitesnake and Rainbow, 'cause I wish them well." "Both Pat and I view Hughes-Thrall as a long term venture. We know that things won't necessarily happen overnight but we're confident enough in ourselves to look ahead to the future. In fact we've already started writing for the second album and there were loads of songs left over that never made the first one. We're taking things very seriously – believe me, this is not a hobby! " At the time of our conversation, Glenn and Pat were preparing to go out on the road and it was clear they were extremely eager to do so. "At first I didn't really want to go back to touring," Glenn reveals, "but now I'm animal for it – we have to get out there. We couldn't bear the thought of just sitting at home." Their first live dates were in Texas with Santana a couple of months ago, after which Hughes-Thrall headlined a few dates of their own. Drumming with them was Tommy Aldridge (he and Pat played together in the Pat Travers Band) but whether he will become the permanent skinbeater remains to be seen. Glenn recently told me: "Tommy had his commitments with Ozzy for his UK tour but Pat and I are hoping that he'll be coming back to us because things were working out very well indeed. In Texas we were playing in front of 10-15,000 people a night and did some great legwork for the future." They also made a promotional visit to Japan in between gigs, fitting in several dozen radio stations for interviews. On such interviews they sounded in good spirits, and the stories of a bust up in most of the UK papers came as something of a surprise. As yet there has been no official word on this. They were due to make a second album in February 1983 (they recorded or wrote enough for a double in the first place), and follow this with dates in Japan and Australia in April / May. A British visit was being arranged for late summer. I've had no word on the tour, so it does look as if something may have gone wrong." 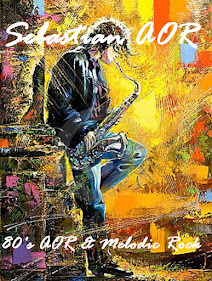 "One of the great mysteries - even tragedies - of the rock world has been the strange inactivity of Glenn Hughes since the Deep Purple bubble finally burst back in stack-heeled '76. Cruelly robbed of (surely) one of the finest voices in the business - not to mention a great bassist and songwriter -we've been teased with many a rumour during Glenn's absence; he was supposed to be in the original G-Force with Gary Moore and Mark Nauseef; he was going to get a band together with Ray Gomez and Narada Michael Walden . . . but nothing - apart from the immaculate 'Play Me Out' solo album in '77 and the odd session - emerged on vinyl. over-confident state and everybody thought the album would be such a big hit that nobody even considered putting the maximum effort into promoting it. When the album bombed, we freaked out." Glenn and Pat split to pursue solo projects (Glenn even being asked by his record company, Boulevard, to do a Thomas Dolby-type album!) and generally take it easy, before deciding to get back together. "We just let time heal the wounds," Glenn explained, "and we were so determined to give it another go." The launching pad for Hughes/Thrall part II was, surprisingly enough, 'Ghostbusters'. The two had been asked to write some songs for the film and took the opportunity to apply themselves to something not directly related to the Hughes/Thrall band in order to get some momentum going. It worked, and although the material was turned down at the last minute in favour of Ray Parker's more 'poppy' offer, Glenn and Pat threw themselves into each other's musical arms with relish, writing and rehearsing some incredibly strong material which would form the basis of their long-awaited vinyl return. With a new, more efficient management secured and all sorts of tour proposals being considered (even a spot on 1984's Donington bill looked likely) it seemed, once again, as if Glenn's sparkling talent would be unleashed. Sadly, it proved too good to be true. When Glenn and I met at London's Chocolate Factory studios in April '84, where he was working on the soundtrack to a film called 'Phenomena', the Hughes/Thrall engine was ticking over nicely and a second album was well on the way. But then, just before Christmas, when Glenn returned to London to record two more tracks for Phenomena', it had fallen apart again. - Glenn Hughes emerged on the music scene in 1969 with Trapeze, the British group for which he was lead vocalist, bassist and chief songwriter. Trapeze was signed to open for the Moody Blues 1969 tour of America and went on to release four albums: Trapeze, Medusa, You Are The Music, We're Just The Band and Final Swing featuring Glenn Hughes.